For the 14.8 million unemployed Americans, help is on the way in the format Americans can understand best: reality TV. Like a sassier Mary Poppins or the "Supernanny" who tells American parents how to get their kids to behave, the new show "The Fairy Jobmother" is another British import where a woman comes sweeping in to save us from ourselves. Hayley Taylor offers job search help in this show on LIfetime Television, although it's help they may want to avoid if they don't like being told that being out of work is their problem and not the result of the worst economy since the Great Depression. In the first episode, which aired Oct. 28 (the show airs on Thursday nights), Taylor offers interview tips, helps an unemployed mom get a makeover, has the couple polish their resumes, and shows them how to follow up on resumes they sent out weeks ago. All of it's basic advice, and having a Marine come in to kick them in the backside might accomplish just as much. What the couple needs is motivation, which comes later in the hour-long show when they face eviction from their apartment in Hanford, Calif., for not paying rent for three months. But early on in the show they don't even have enough motivation to wash the dishes or take the dog outside to go to the bathroom. Shawn Aughe, who has been unemployed for three years, sounds very much at the beginning of the show like he's counting too much on someone else to come in and clean up his life. "I hope very much that she's going to change our lives," he says of Taylor. "I pray that she can get us a job. Because we've done everything that we could." Not really, as the job nanny, Fairy Jobmother or whatever you want to call her, finds out. But even if they had done the simple task of making followup calls to employers they've sent resumes to, the jobless Aughes are a bad example of people looking for work -- mainly because they weren't doing much job hunting before the Fairy Jobmother showed up. If everyone was as lazy as this TV show couple is, the 9.6% national unemployment rate would never drop. While plenty of jobless people may need a makeover of their hair or resume, and a kick in the seat of the pants to get off the couch and actively seek work, the Fairy Jobmother's methods don't address the main problem of unemployment -- it's not the fault of the unemployed who have done everything they can to find work (although that's not the case with the family in the first episode), and telling them that they're lazy doesn't solve the crisis if more jobs aren't available. Ben Stein did the same thing when he dissed the unemployed, and it still doesn't hold water. An attitude adjustment isn't needed -- more jobs are. 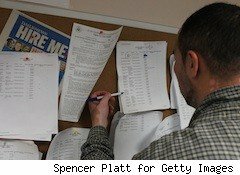 Yes, job training is needed and the jobless should get free help if they need it on how to write a resume, how to interview, and other job-searching techniques. But expecting one person -- no matter how lovely her accent is -- to come in and help you find a job with nothing more than some job hunting tips you could find anywhere, including at WalletPop, is unrealistic. Being unemployed and going three weeks without applying for a job is pathetic, but it's a bit more pathetic to resort to having a job nanny come to your home and remind you to call back employers you sent job applications to. If if remedial education is all she has to offer, let her stay in Britain, where she's already helped families with some minor tweaks while the bigger picture goes unchanged.